We inform you of the benefit of e-filing new patent applications before the U.S. Patent & Trademark Office (USPTO). These benefits include the capability of receiving the application serial number immediately after filing the application, obtaining the official filing receipt (OFR) quickly, and reducing the official fee for small entity applicants (filing fee of $462 in comparison to $545 for paper filing). We are encouraging applicants to take advantage of these benefits by exchanging information and documents electronically. If one opts into the e-filing program, we will not require paper confirmation copies. Instead, we will require that all exchange of documents is done electronically via email. Each receiving party will confirm safe receipt of the documents by return email. 1. Sending party sends the documents (discussion on types of documents provided below) and a list of the included documents via email to mail@baconthomas.com. 2. Bacon & Thomas will confirm safe receipt via return email that the documents have been received according to the list in the email. 3. A fillable PDF copy and a MS WORD copy of the ADS may be found on our website at www.baconthomas.com/forms.html. 4. For future documents sent by Bacon & Thomas, all correspondence will be handled electronically. When Bacon & Thomas sends the correspondence, the receiving party is expected to confirm safe receipt of all documents. We require the relevant documents to be sent in the following formats. 1. Specification: MS WORD only (.doc or .docx). The specification includes the written description, claims, abstract. 2. Drawings: PDF or MS WORD. We will NOT accept drawing files sent in any other format, including TIF and JPG formats. 3. IDS (information disclosure statement): A listing of the prior art documents in MS WORD or PDF (we will prepare the actual information disclosure statement form for filing on our side). a. Format of IDS Request: When sending to us a listing of prior art documents to filed in an IDS, please provide at least the patent publication number AND either the publication date OR the name of the patentee or applicant of the cited document so we can confirm that the listed document number is correct. b. Non-US Patent Publications: We will require a PDF copy of any non-U.S. patent publications including non-patent literature to be cited in an IDS. We will require an English language abstract for a non-English publication or an English language equivalent of the publication. We do not require copies of U.S. patent publications. 4. ADS (application data sheet): PDF or MS WORD. 5. Declaration: PDF with the appropriate signature(s). 6. Assignment: PDF with the appropriate signature(s). Please do not sent documents in any other format other than those listed above. Sending any documents in formats other than those described above may require additional services fees required to format the documents into formats acceptable for filing before the USPTO. 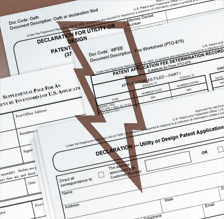 A fillable PDF copy and a MS WORD copy of certain USPTO forms may be found on our forms page. Please note that a certified copy of the priority document, if any, cannot be not be electronically filed; instead, the priority document must be physically filed at the USPTO.